GoGirl Fitness Studio offers personal training to women of all fitness levels. 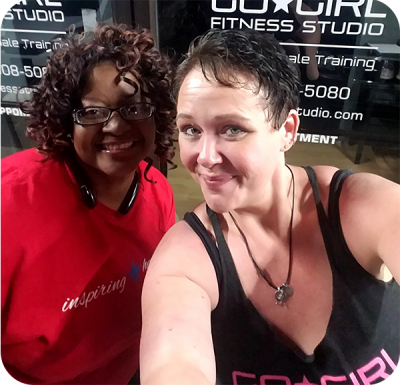 Our mission is to provide safe, affordable and fun fitness programs that empower women to take control of their heath and wellness in a judgment free, community oriented fitness environment. GoGirl Fitness Studio was opened with accountability in mind. It’s a place where women can gather to exercise and support each other. Attending sessions weekly helps you stay on track. Knowing that you are missed when you are not here helps us hold each other accountable. GoGirl Fitness Studio was founded in 2013. The goal was to be one of the city’s premiere, women’s only facilities. The concept was relatively new: only offer personal training and offer it to women only. Instead of being another gym, the objective was to stand out from among the crowd. In 2017, Beverly Okenyi became the new owner of GoGirl. Prior to GoGirl, she had worked in challenging corporate America for more than 20 years. Beverly didn’t start gaining weight until her adult years. Beverly began working with Pandora as her personal trainer and Pandora helped her realize that she could not give up the fight. She also realized how important an environment like GoGirl was and that working with a trainer like Pandora was important to so many women. Purchasing the business was a natural culmination of the confidence and success she found at GoGirl and the desire to share it with other women. Pandora, manager and head trainer, is a walking success story. After a life changing loss of 260 pounds, she committed herself to helping women get healthy and stay healthy. She brings her own brand of enthusiasm to GoGirl Fitness Studio and has innovative ideas that help women reach their fitness goals. Pandora is a certified trainer and uses her wealth of knowledge to promote exercise and healthy eating habits for women at all fitness levels. Beverly and Pandora believe that fitness fits everyone! You can be sure that at GoGirl Fitness Studio, you will be welcome no matter where you are in your fitness journey.